I have been away for the holidays and awaiting the birth of my first grandchild. He arrived Jan 6, 2016 and his name is Jack, after my father. I am so excited to be a new grandmother. My current interests are making junk journals and love to collect things to put in them. ATC's, tags, rolos, inchies, twinchies, bookmarks anything where I can use images and embellish. I have recently started making journal pages and I enjoy those as well. I also like to alter things and collect all kinds of different items and embellishments that I can use in alterations. ITEMS I LIKE: I love images anything I can fit on an ATC, Rolo, Journal Page, or junk journal. I love vintage ladies, men, children, gypsy, ballerina, fairies, Angels, butterflies, flowers, seasonal, animals, dogs, objects etc. Frozen Charlottes are a new fave I love the minature dolls as well as images I can use on atc etc. I also like Victorian an retro images as well as the unique, weird, funny and different all kinds of images that I can use. I also collect all types of embellishments such as lace, trim, diecuts, metal pieces, game pieces, charms, bling, resin, crochet, something handmade I'm not picky surprise me. I still love paper as well. I love anything shabby chic or vintage both styles are my favorite! I am lovin the Flamingo's and pineapples anything to do with beach, lake, camping (especially those retro campers) just too cute, fishing and the hula girls can't forget them. I live in Oklahoma and I am married (12yrs ) I have two grown boys who are wonderful young men. I also have 3 dogs that are rescues. I never intended to adopt 3 dogs (chihuahua's) it just happened that way and I love all animals and try to support them as much as I can by raising money doing bike runs and giving what I can for their charities. I got into crafting when my son left home and I turned his room into a crafting place, my room where I can play with my crafts and forget about everything. I have decorated it "shabby chic." I like the muted soft colors such as pink and green, lavender. I even have a pink and clear chandelier. I am in the process of organizing all my crafting supplies. Just when I think I have enough and all organized, I find something else I think I need and the organizing never ends. I love pretty boxes to hide my messy craft supplies. I hope I am not the only one who does this. Can anyone have too many crafting supplies? I pretty much like unique and different things as well. LIKES - I like to collect decorative paper, die- cuts, embellishments, ribbon, beads, paper/fabric flowers, Tim holtz items, anything with "Harley Davidson" motorcycles, like decorative clothes pins, mini-hangers, anything that is crochet, pretty scraps of material, pretty book marks, rubber stamps, vintage postcards, stamps from other countries, ATC supplies, and anything you could probably think of I will most likely find a use for. I like anything from Shabby Chic, Victorian, Vintage to Industrial Chic, and rustic, steampunk, etc. I like to make crafts that require a distressing techniques on boxes, charms, papers etc. I also like the pretty style like the Paris/Eiffel Tower things that are lacy, girly, fluffy. I love animals especially dogs (chihuahua's) and Owls. I also like to decoupage using papers that includes vintage looking script paper or pretty napkins. I also like ideas or instruction for a craft item that I can make. I recently began collecting vintage images of witches, love it on a tag or ATC. I like the vintage photos of vintage girls, vintage ladies, vintage pin-up ladies, black n white or anything different. I like to take ordinary objects and alter them into something completely different. I like to use rusty metal pieces, junk that most people may throw away I will find a way to recycle it into "my little piece of artwork." I also like the cute but kind of creepy images of Ryden and Mab Graves. I would love to receive something altered by you. I don't have one particular style when it comes to crafting because I don't want to be limited I think it depends on what I am trying to create and I like to keep my options open. I am really very easy to please. **Would like to receive ** - All types of ephemera, love printed images, especially vintage and Victorian, embellishments, unique paper, lace, ribbon, die cuts, handmade envelopes, easy to please. CAN'T HAVE - Due to a chronic illness I am not allowed to have any sweets in my diet. I hate to sound picky, but I would rather you give those items to someone who can get enjoyment from them since I can't anymore, thank you. Since I can't have them I like to craft with pics of sweets like cupcakes, pretty candies etc. DISLIKES - I DON'T LIKE PARTNERS WHO DON'T RATE!!!!! NOT COOL : I think non-raters are worse than flakers to me because I put a lot of times and effort into my swaps. I would much rather receive a rating based on my swap. I am very easy to please and like a variety of styles. I don't like anything "blood/slasher gore," but I do like different, unique, crazy, freaky and love Halloween and all the characters especially like vintage witches, I also like like Angels and crosses, etc. Mainly anything shabby chic and if it's light pink I will love it. I guess if I had to choose something I don't need it would be plain envelopes and plain stationary, childish items (cartoon characters etc. ), reward stickers, no Disney. My favorite colors are soft pink!!!! and green (pistachio or mint green) peach, lovin all the pastels that are in style right now. I also like the primary and bright colors so it depends on my mood and the project..I like to incorporate all colors into my crafts so no color is off limits. I also,like vintage, steampunk. If I am doing something wrong or you didn't receive my swap please send me a message to correct. Due to the price of postage I don't send certified and some of my things have got lost in the mail so contact me and I will resend. I try my best and take a persons profile into consideration when possible. If there is something you don't like please let me know I can take criticism, I am trying to improve myself as a crafter as well as a good swap partner. NON-RATER @ccgigglebox - VC: Hand made envelopes Swap, She is currently active and participating in other swaps. Comment: Thanks for the rabbit Atc..love it! Comment: Kim, thank you so very much for the lovely tag and the great extras! And, as always, you created a beautiful little work of art! So beautiful! So happy to have this in my tag book! Love swapping with you! Response: You are so very welcome so glad you liked your swap. Comment: What an unbelievably wonderful swap!!! Thank you so much for your thoughtfulness and all the attention to the smallest details! I just love it all!!! Thank you so much for sending the additional post cards!! You sent so much the first time, it was completely unnecessary....but appreciated!!! Comment: Oh my, what a stunningly thoughtful parcel! Thank you so much, I love every last bit. I appreciate that sending international can be tricky but I'm so very pleased that you did. I'm wallowing in shabby loveliness! Comment: Oh my! It was like opening an unexpected birthday gift and only a few days late for my actual birthday. The tage is drop dead gorgeous and all the extras are just too much fun. They will certainly be put to good use! Wish I could give you more hearts! Comment: Hi Kimberly! I apologize for taking so long to rate you. OMG...what a wonderful swap! Your Valentines Rolo is absolutely gorgeous! I love every little detail...so pretty! Love all the lovely embellishments that you used to create such a beauty! Thank you so very much for all the wonderful extras. You are very generous! I especially love the vintage paper napkin. It is always such a pleasure to swap with you. Thank you, thank you, thank you! Comment: This is an amazing circus skinny, Kimberly! I love all the layers and textures you used! It's just so well done and beautiful! Thank you so much! And love the extra bits of circus goodies, too! Thanks for being my partner!! Comment: Kim, you're such an artist! All you work is always so special. I couldn't find these initially because I had already added them to my journal fodder envelope! Love the variety of colors and designs. My absolute favorites are the purple one with the green triangles and the pink/green combo with flowers. You sent so many--I'm so happy! Thank you for always being a wonderful partner. p.s. Your extras are AMAZING! They deserved their own swap ;+) Thanks bunches. Comment: Oh my Kimberly what a pleasure to receive your beautiful swap, I love everything about it. Also thank you for the extras. This was a great swap. Comment: What a stunningly beautiful ATC! I love it! All of the extra treasures you included are wonderful as well. Thank you for a truly perfect swap!!! Comment: Wow!! Never would have guessed you were a newbie at this - they are all gorgeous!! And all the addtl papers and extra prints - so generous and extra special! I feel like it’s my birthday early! Extra hearts and hugs!! Response: Thank you so much, I am so glad you liked them. Comment: This swap deserves so much more than one heart! You blessed me beyond anything I could have imagined. And the doggie stickers are so sweet; Flash and I will love using them. Comment: Well done. A very nice package! Thank you. Response: Thank you so much, so glad you liked the swap. Comment: Oh Gracious! This was like Christmas all over again. The Snippet roll was absolutely gorgeous-I never thought to paper the spool and the ends-very creative. AND THEN- all the wonder extra goodies you sent me-such beautiful laces and other bits-THANK YOU ever so much for sharing! Great Job! Response: I am so glad you liked your swap. I was so nervous because I never made one before. Thank you for the wonderful comments. Comment: I wish I could give you 100 hearts.The rolo is truly a work of art.It is so beautiful.And the extras are amazing.Thank you so so much for all the time and effort you put into this wonderful piece.By far a true favorite. Response: Thank you so much, you made my day. Oh Kim...what a fabulous selection of vintage ephemera you sent to me! I love it all, and will use every bit of it. You are one of the loveliest ladies on this site...a wonderful swap partner, and an equally wonderful friend. I treasure you! 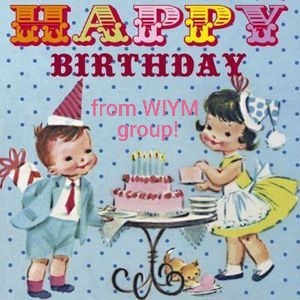 HAPPY APRIL BIRTHDAY WISHES from WIYM! Welcome to Planner Partners! Jump right in and join the fun! Haha - great finish to the fishing ATC Jam. Thank you!